Delivered to Reconstruction Finance Corp as 44-34766, 19??. - Immediately put up for dispossal, 1945. Dianna Converse Cyrus Bixby, 1947-1949. - Flown as Bendix Racer #91/Huntress. - Fitted with bomb bay fuel tank for Bendix cross-country race, 1947. Standard Oil Co (Indiana), Chicago, IL, May 31, 1965. Nine Ten Corp, Chicago, IL, Aug. 4, 1965-1966. Miami Aircraft Ventures Inc., Miami, FL, 19701972. - Displayed as USN JD-1 "34766" port side. - Displayed as USAF 34766/Mary Jo starboard side. Larry Leaf, Willston, FL, 1990-1991. - Damage in mid-air collision with Brady's T-37. 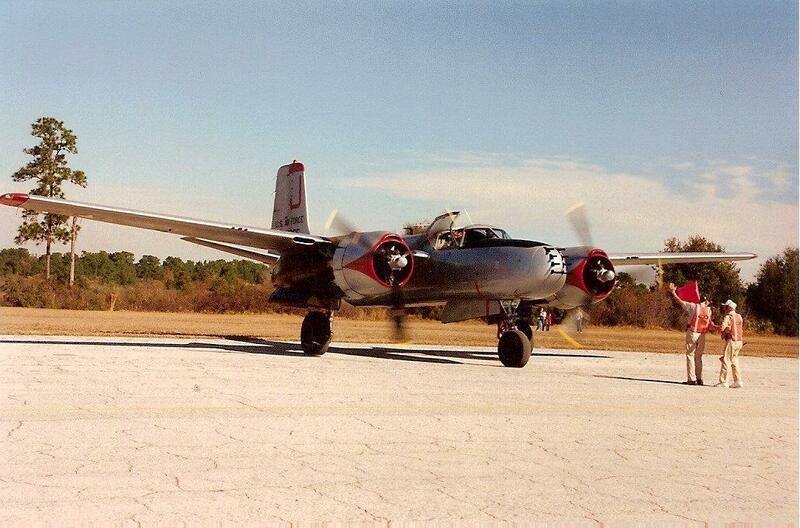 - A-26 landed safetly, Cartersville, GA, June 7, 1991. Reva J. Brady, Cartersville, GA, Feb. 1992. Museum Of Flying, Santa Monica, CA, 1993. - Restored to executive configuration, Mojave, CA, 1993-1995. Howard B. Keck/Thermco Aviation, Thermal, CA & Coachella, CA, May 25, 1994-2002. The docket is stored on NTSB microfiche number 45575. Injuries: 2 Fatal, 6 Uninjured. 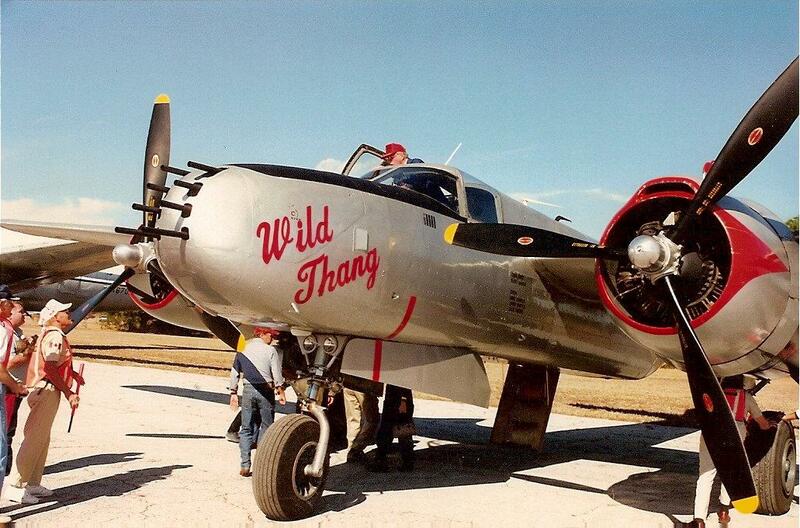 A T-37 AND AN A-26 COLLIDED IN FLIGHT AT 9500 FEET MSL WHILE PRACTICING AN ACROBATIC MANEUVER. THE MANEUVER REQUIRED THE T-37 TO PASS UNDER THE RIGHT WING OF THE A-26, AND TERMINATE THE MANEUVER WITH A ROLL. 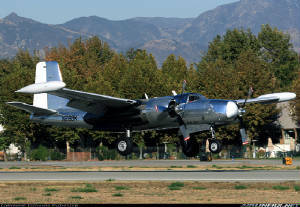 ACCORDING TO THE A-26 PILOT, THE FIRST FLY-BY WAS COMPLETED OUTBOARD THE RIGHT WING WITHOUT INCIDENT. 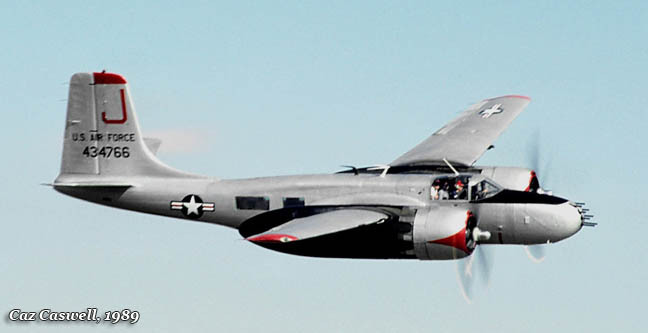 BUT, ON THE SECOND ATTEMPT, THE A-26 PILOT NOTICED THAT THE RUDDER AND A PORTION OF THE RIGHT RUDDER AND HORIZONTAL STABILATOR WERE MISSING AS THE AIRPLANE EMERGED FROM BENEATH THE RIGHT WING. EXAMINATION OF THE A-26 AND RECOVERED COMPONENTS INDICATED CRUSH AND IMPACT DAMAGE FROM CONTACT WITH THE RIGHT PROPELLER OF THE A26. THE A-37 CRASHED AND BURNED. THE T-37 PILOT MISJUDGED THE CLEARANCE BETWEEN HIS AIRCRAFT AND THE A-26.